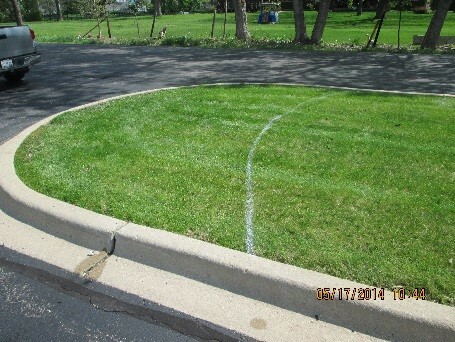 A visual demonstration of good Corporate Social Responsibility. 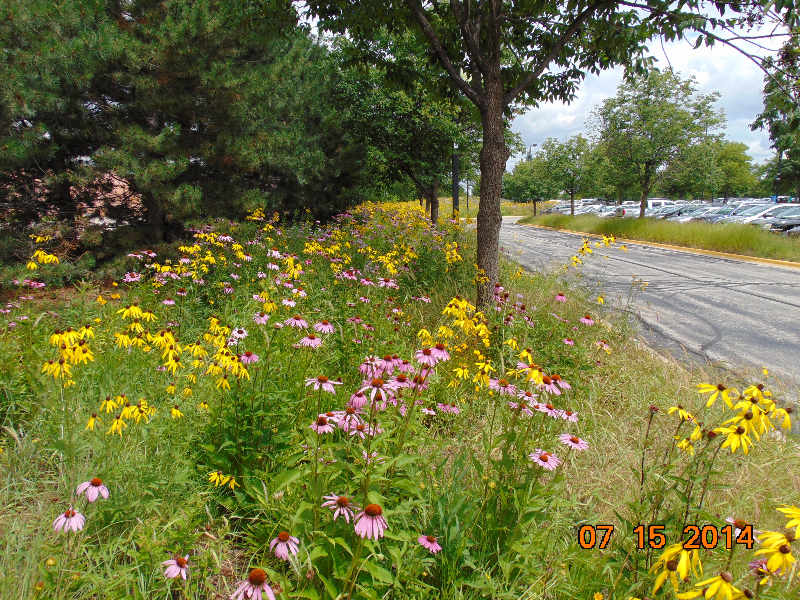 While not glamorous, routine site stewardship (maintenance) is necessary to create and maintain a healthy native planting. 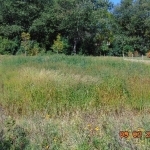 The photos below show typical native landscape maintenance. Left, selective cutting. 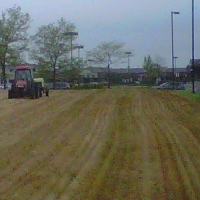 Center, spot herbicide treatment. 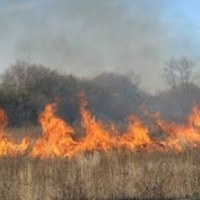 Right, controlled burning. 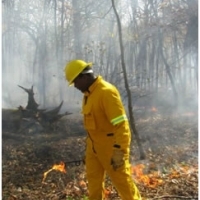 Fire is an important tool in natural area stewardship. 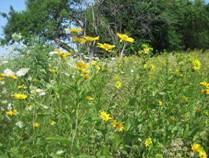 It helps control invasive and non-native plants, while encouraging native species to thrive. 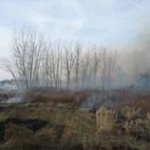 The photos above show a wetland area in bloom in September, and being burned in November. 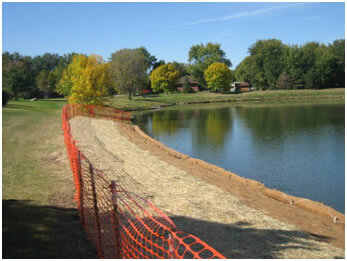 Detention pond bank edge restoration. 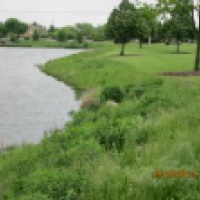 The following photos show a detention/retention pond bank area that was originally installed in cool season turf. 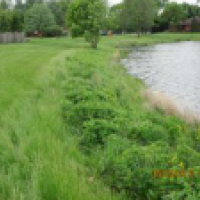 The bank was not mowed regularly due to the steep slope grade and water edge erosion causing an uneven surface. 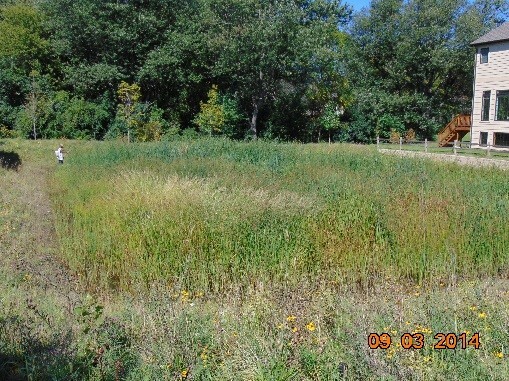 The bank became overgrown with weeds and the owner decided to restore the pond edge. 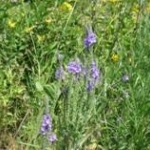 The weedy plant growth was sprayed with herbicide and then manually removed. 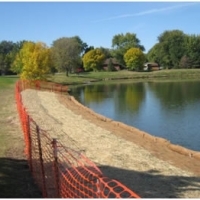 The bank was regraded to provide a more appropriate slope grade. 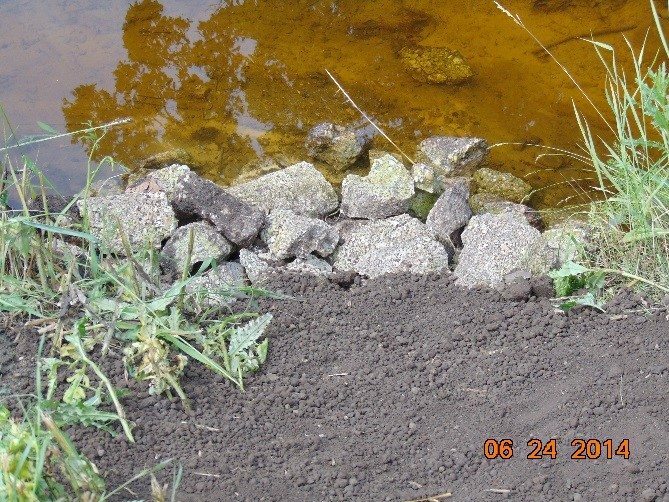 The edge was seeded in natives and covered with erosion control blankets. 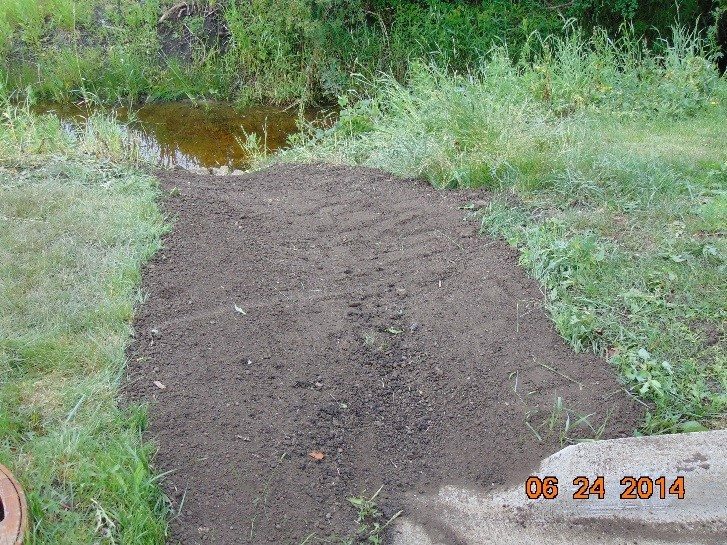 The water edge was treated with coir fiber logs to allow the water edge plants to get established without being destroyed by wave motion and winter ice. 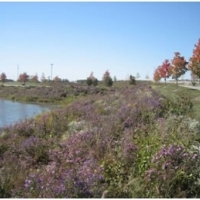 Deep rooted native plants are much better than cool season grasses in holding the soil together on detention pond bank edges. 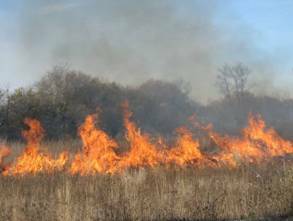 Native plantings have the added benefit of helping to control geese who do not like the native vegetation hiding potential goose predators. 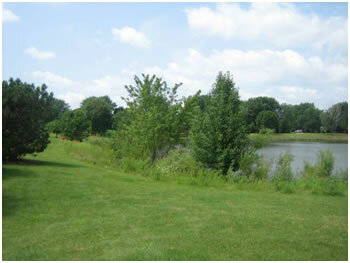 Before, during and after photos of the pond edge restoration work. 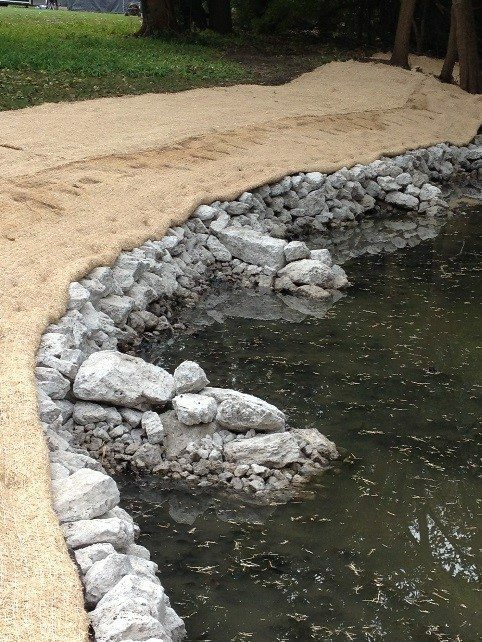 A stone ledge was installed as a pond edge access platform to control and reduce traffic along the rest of the restored area in order to give the restored area time to get establish. 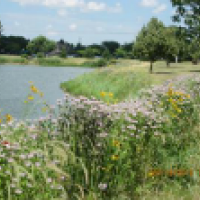 Local residents use this pond edge very heavily for fishing, walking their dogs and playing in the water at the pond edge. Even before the restoration project was completed, the stone platform was being used by local fishermen. 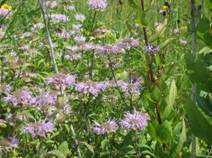 The banks are now covered with attractive and effective bank stabilizing native plants. 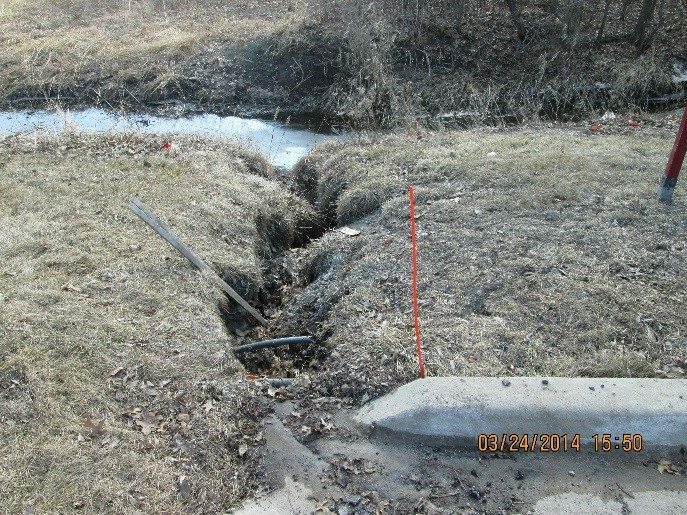 A slight change in alignment of a concrete culvert caused minor change of downstream out-flow that eroded one side of a stream bank. 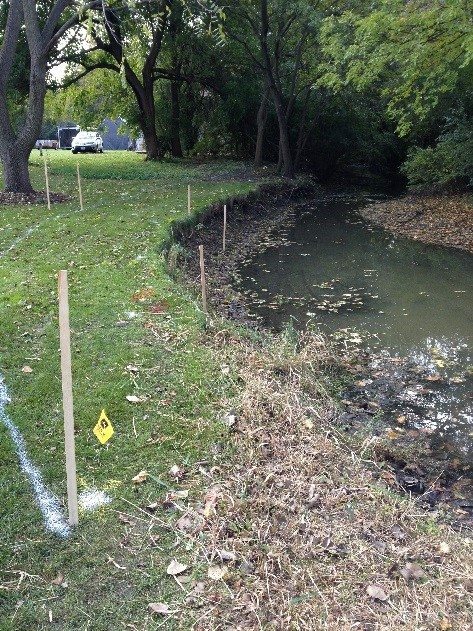 Bedrock Earthscapes, LLC enlisted the aid of Living Waters, Inc. to engineer the proper combination of hard and green BMPs to solve the issue. 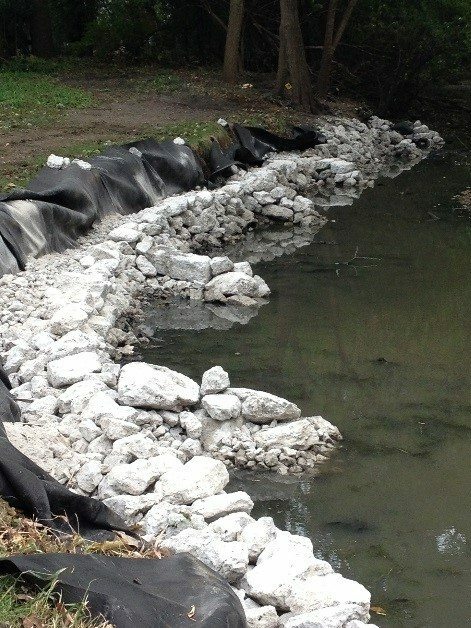 Bedrock Earthscapes, LLC completed the bank remediation including installation of a rock toe and several rock points, seeding with natives in the Fall and covering with erosion control blankets, and then installation of native plugs in the following Spring. 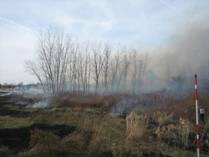 Stewardship will continue for three years to ensure proper establishment of the native plantings. 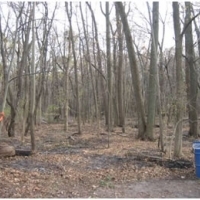 This mature Oak woodland area was maintained in turf for years. 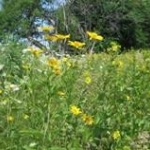 It is being restored to a native plant area to protect the oaks, enhance beauty and reduce maintenance. 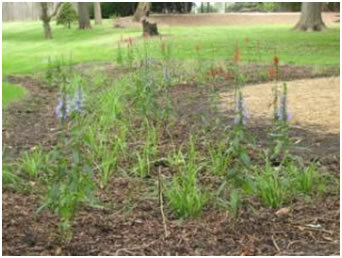 The woodland edge was treated to kill the turfgrass,and was then overseeded with a woodland shade seed mix. 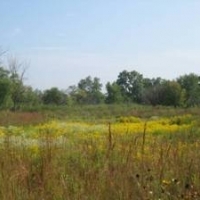 The area is shown during establishment in the top row of pictures in April, in June before a second Round-Up application to a perimeter band, and in July as a native seeding with cover crop is emerging. 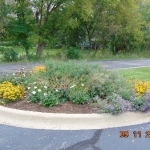 The beauty and diversity of the native planting now, can be seen in the two photos above. 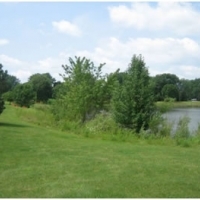 The photo on the right shows this converted area three years later being recognized as a “Conservation @ Work” site. 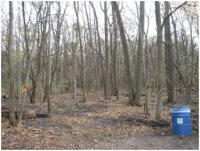 These photos show a woodland prior to initial restoration work on the left and after invasive brush cutting and a Fall burn on the right. 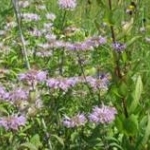 The woods were full of honeysuckle, poison ivy, buckthorne and box elder. 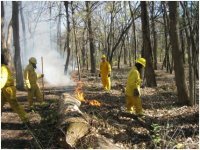 Ongoing stewardship will continue to address control of non-desirable plants and the promotion of conditions that favor native plant growth and a healthy woodland. 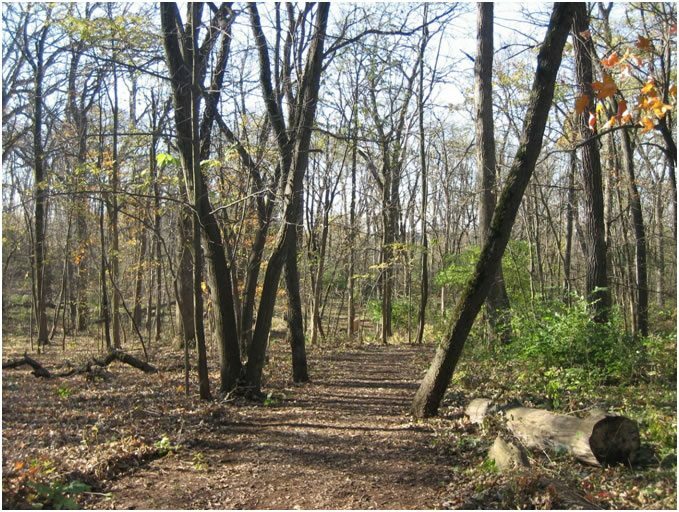 The woodland area on the left of the path shown above has been cleared of non-native shrubs, while the area to the right of the path has not. Non-native shrubs stay green later into the year, create a dense woodland understory and shade out desirable herbaceous woodland plants. 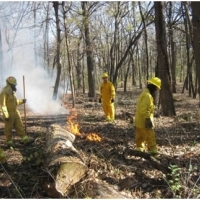 After brush removal, fire is used to promote the emergence a of native understory habitat. 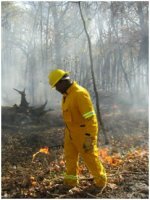 Bedrock Earthscapes, LLC teams with Wildland Management, Inc. to provide prescribed burns as one management tool in natural area restoration and stewardship. 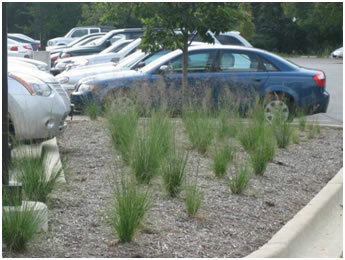 Small turf areas can be converted from turf to native plantings to enhance beauty and reduce maintenance. 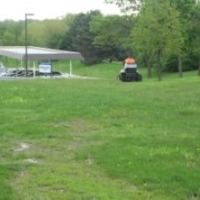 The three photos above, show show a large parking lot island in turf prior to conversion, then at the time of establishment in June using one gallon plants, and the same area in September. 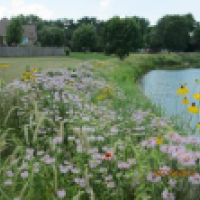 These areas no longer need to be mowed, trimmed and blown off weekly, thus reducing labor, fuel use and pollution, as well as adding beauty and interest to the landscape. 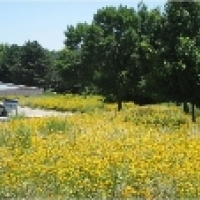 This parking lot island was converted from turf to native grasses and flowers in June. 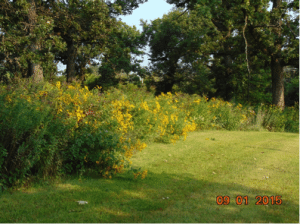 The photo on the right shows the first year growth in September. 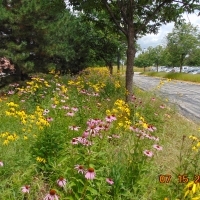 This area no longer needs to be mowed, trimmed and blown off weekly, thus reducing labor, fuel use and pollution, as well as adding beauty and interest to the landscape. 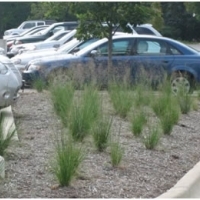 Photos showing another parking lot island that was converted from turf to Prairie Drop Seed using plugs planted at 18″ centers. Note salt damage on turf in left photo. 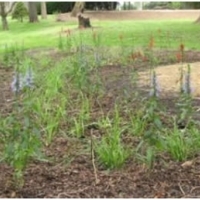 Photo on the right was taken in September showing that an attractive outcome can be attained within one season using native plugs. 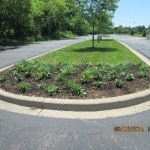 The planting was done in May. 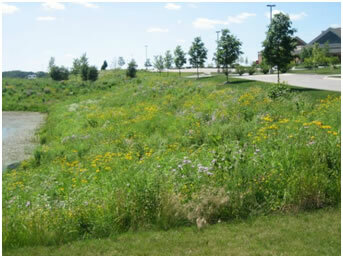 The open turf of this property was converted to a low profile prairie. 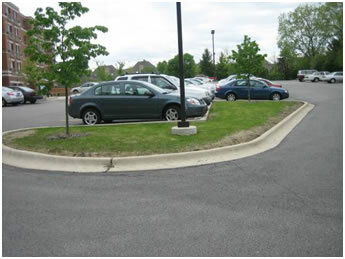 Shown here is one area at establishment and again three years later. 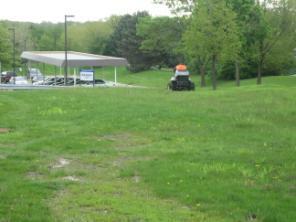 These two photos show another turf area being mowed in May prior to conversion. 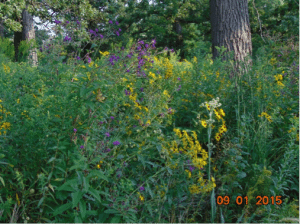 It was planted in June, and shown a year later in the right photo as low prairie with early establishment native forbs in bloom. 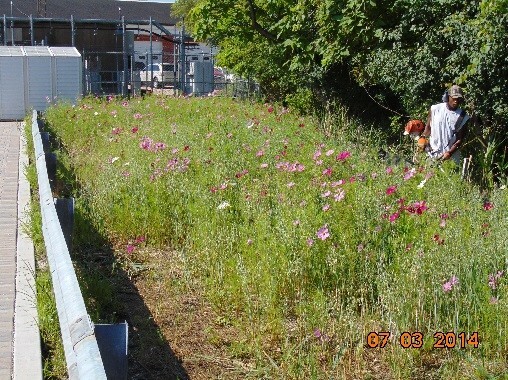 Interestingly, the neighbor’s contractor stopped mowing a 15′ strip to the right of the prairie planting, providing additional environmental benefit. 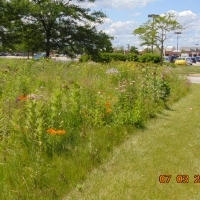 Rain garden planted with natives to help absorb site runoff. 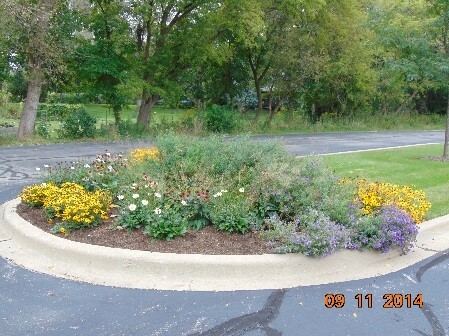 Rain gardens can help intercept and reduce site runoff. 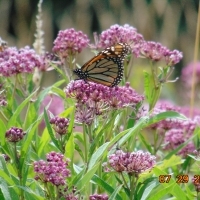 They can also help solve the problem of low, wet areas in your landscape, turning them into attractive gardens that help improve our environment. 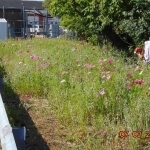 Keeping rain water on our sites, where it falls, is the first step in preventing flooding further downstream. 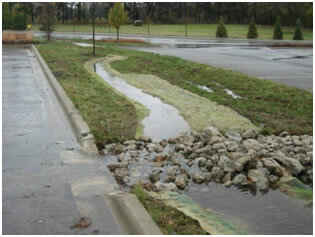 If we each keep all rainfall from a 1″ rain on our site, we can eliminate 80% of today’s flooding problems. 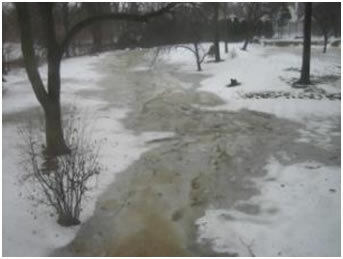 You can see the drainage coming from the neighboring property in the upper left on the winter photo. 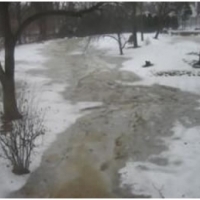 The surface flooding is most severe in the winter when the ground is frozen. 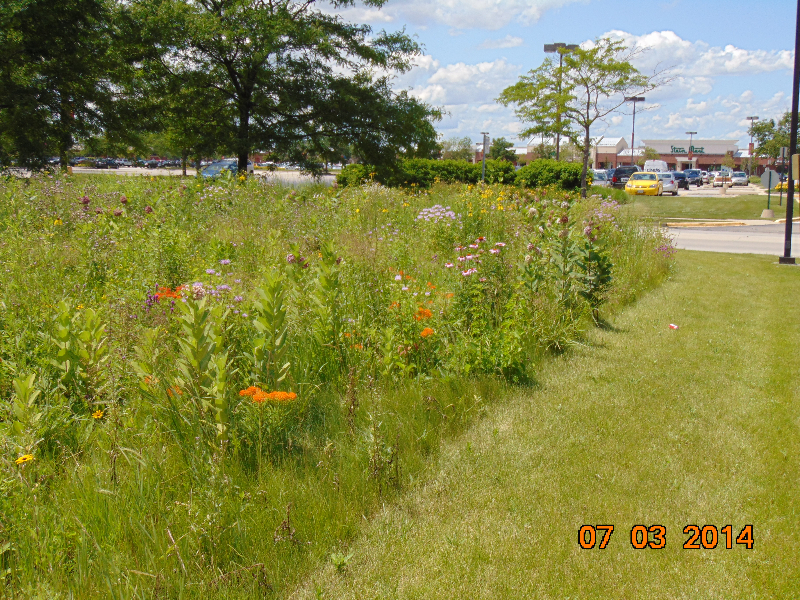 On the right is a new rain garden in the low area one month after establishment with native plugs in August. The cut tree stump gives you some relative perspective in the two photos. 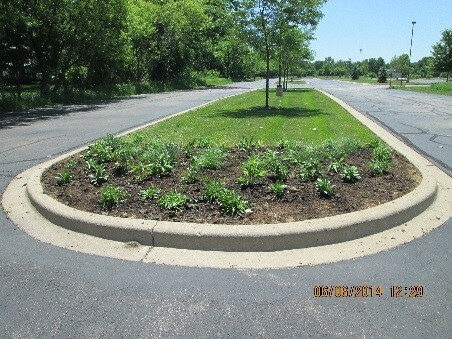 During the growing season, this new rain garden will help absorb most of the surface runoff that makes it to this low area. Clay drain tiles that were previously in this area were removed. 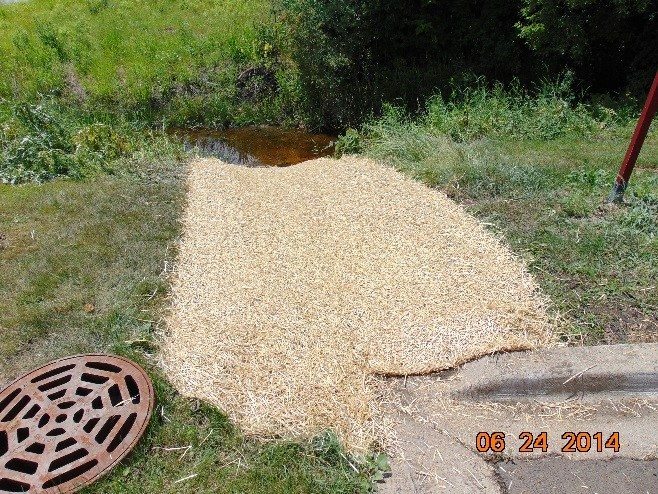 Use of level spreaders is another way to intercept surface runoff, and to spread it across a larger surface area to promote more on-site infiltration and less downstream flooding. 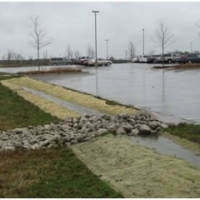 The photos below show this concept in pre-established parking lot islands that had been hard armored with rip-rap to reduce the velocity of parking lot runoff previously concentrated into a narrow area. 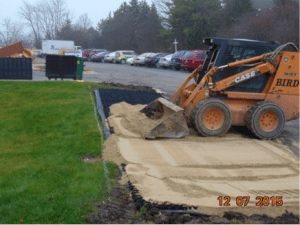 Water now fills the length of the open level spreader and then overflows across the entire soil area, helping to reduce the amount of water leaving the site. The turf on these islands is no-mow fescue. 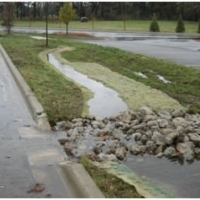 Water from a very large parking lot is all directed through a small curb cut, and then flows down a steep bank to a nearby pond. 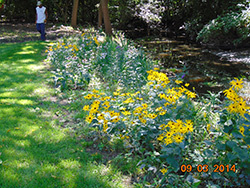 The pond bank was modified and planted in natives a few years ago, but the intense water flow eroded the soil before native plants could take hold. 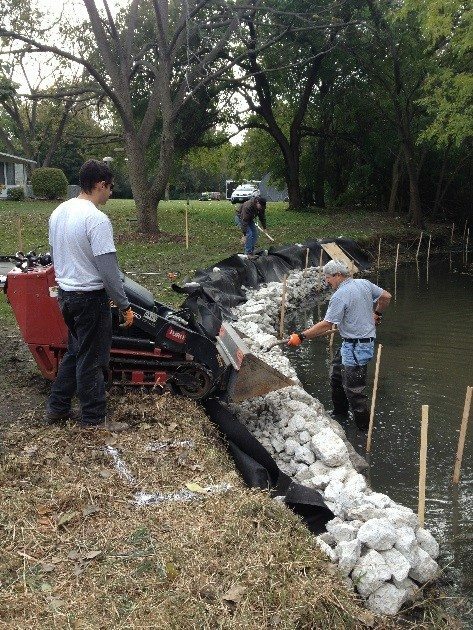 Corrective action included filling the 4’to 6’ deep erosion channel and compacting as we filled, grading to a slight surface swale, installation of a rock dissipater at the water edge, seeding, blanketing with a straw blanket and then covering the channel with Shore Max rubber matting to prevent future sheet flow surface erosion. 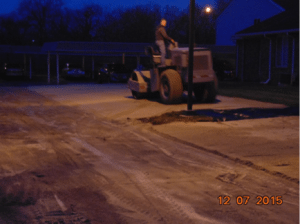 Hardsurface paving reduces pervious surfaces for rain water to sink back into the ground, contributing to our flooding problems in the Mid-West. 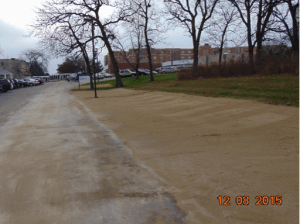 Here are some photos from a temporary, pervious parking project that was done with minimal soil disruption and no reduction of pervious surface. 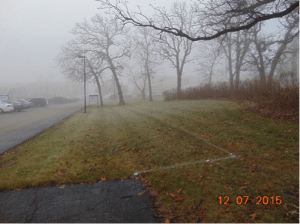 Areas along existing driveways were selected for added parking. 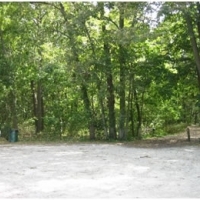 These two photos show an area before and after the installation in mid-December. 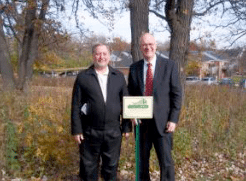 The area will be seeded in the Spring to provide vegetative cover. 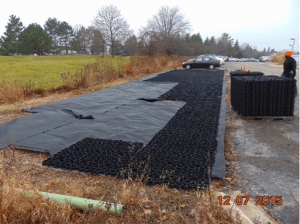 After minor surface grading, a water permeable fabric was put down to support the plastic grid and prevent it from settling into the soil. 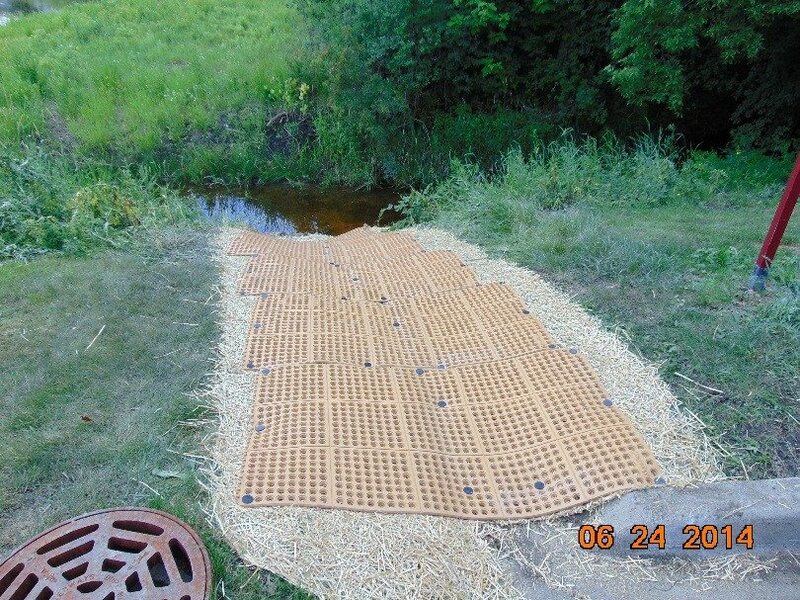 A weight bearing plastic grid was then put down and snapped into place. 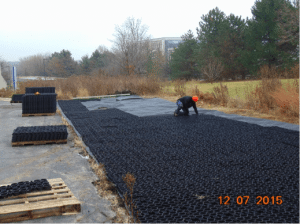 Sand was used to fill the plastic grid, adding structural strength a smooth surface. 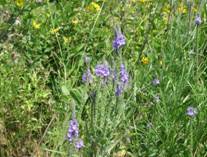 It also provides a medium that can be planted with turf. 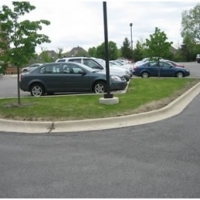 The surface was then rolled to settle and firm the entire parking system. 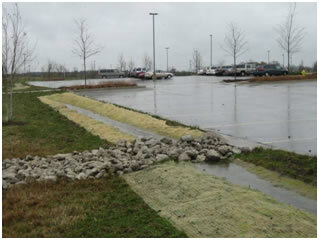 Below is a photo showing a finished temporary, pervious parking area. 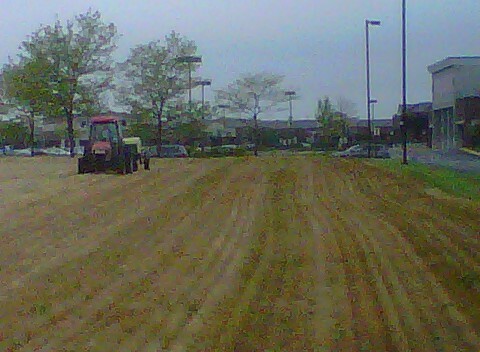 With seeding, this will blend into the existing turf and provide overflow parking. 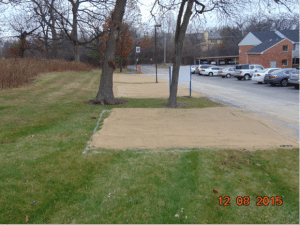 When no longer needed, the system can be left with a turf cover or easily removed and the area reseeded. 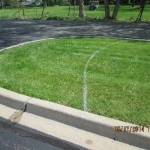 Meanwhile, there has been little or no surface disruption and soil permeability has not been reduced. 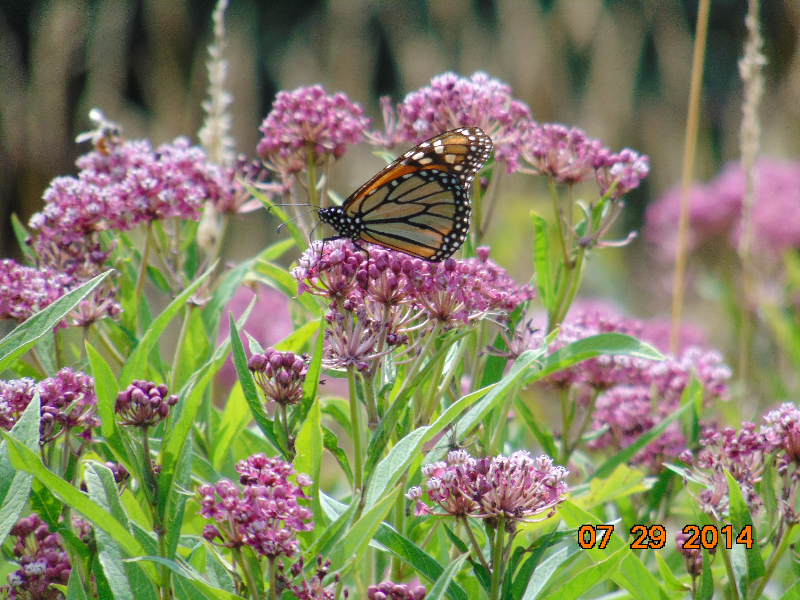 Native plantings add beauty and diversity to the landscape. 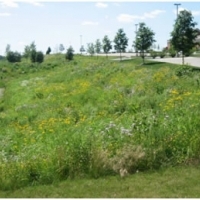 Unlike today’s commercial landscapes which cannot sustain nor reproduce themselves, with some simple ongoing stewardship, native plantings will create a unique and sustainable ecosystem adapted to each micro-environment in which they exist. 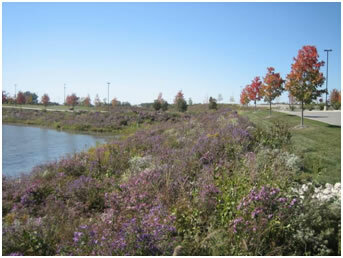 A detention pond native bank planting shows a beautiful and changing landscape four years after establishment. These photos were taken in July and in October. 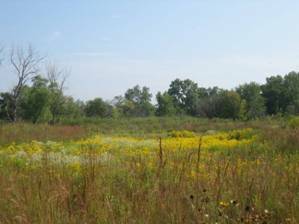 Effective routine stewardship has made a significantly positive impact on these areas. 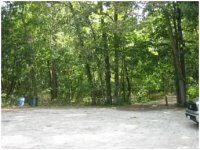 Two more pictures from created native areas.